"The new Museum Heritage has been developed in co-operation with high-quality image reproduction labs to ensure it delivers the maximum structure where ink can reside and be retained making it the toughest art surface the world has seen to date." This is a 310gsm natural white art paper with a pH neutral base that is delicately textured. Produced from a mix of cotton and alpha cellulose which gives a soft feel while retaining the rigidity the art printing and framing makers demand. 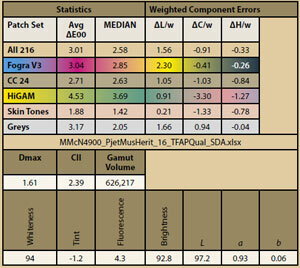 Museum Heritage 310 delivered a good gamut volume of 626,217, the highest of the textured media and a colour error overall of just 3 points. PermaJet claim that the latest inkjet technology addresses ink transfer issues in previous versions to provide superior ink retention and full archival stability. The moderate level of OBAs will give it a bit of a lift to the tones. The Artist Watercolour 250gsm textured art paper has an off-white base tone and is made from alpha cellulose. The mould-made base material has a highly defined rough surface that delivers incredible fine art prints. The strength of the tooth is more akin to a pastel paper or one that might be used for charcoal work. It is suited to the reproduction of artists' watercolour work or the output of photographic images from which you wish to achieve subtle artistic impressions. It has the second highest colour gamut volume of its group and a Dmax of 1.65, the highest of the group. The highlight end of the range is a little compressed as detail is lost in the structure beyond 246 RGB points. Conversely, the shadow detail is excellent, differentiating all the way down to 20 RGB points.